Girls something amazing happened recently, I've discovered the mother of all setting powders. One that makes me look in my compact mirror and think wow is that my skin?! Believe me that rarely happens ;) My Rimmel pressed powder just wasn't cutting it and the Chanel powder compact I carry in my bag had started to crack. It was time for an upgrade. So a trip to Space NK later, I discovered the Laura Mercier Pressed Setting Powder, the finely milled cashmere talc powder promises to leave you with silky looking skin all day. The powder also comes in loose form, but the compact appealed to me more for easier application on the go. The powder comes in one translucent 'Universal' shade, don't be alarmed by the white powder it doesn't leave you looking like a ghost. Use the sponge applicator to pick up the powder, tap off any excess on your hand and press gently over skin. A little really goes a long way and it feels super sheer and lightweight, setting makeup in place and taking away any shine. I wanted something that would look natural but not necessarily give me any more colour, like some pressed powder, which can look cakey and heavy. The LM sales assistant recommended to apply with a fan brush as it gives a light coverage without going overboard. A large powder brush would pick up too much product but the sponge applicator that comes with it works well, until I get a fan brush! If I have to be out all day, I'm not keen on touching up with heavy powder as it can make my skin look dull and dry. The LM powder is the opposite, it seems to make my skin look smooth, even and silky. It does last much better than my previous powders, although I can't really stop shiny skin from creeping in, this does a great job at keeping things in check. The packaging does however feel slightly flimsy, but I love the fact that the sponge sits underneath the powder in a separate compartment and not on top of the powder itself. I also like that the sponge has a part to pop your fingers in to hold it for easy application. It's £25 for the compact and £29 for the loose powder, available at Space NK and most large department stores. What's your favourite setting powders? I have oily skin too and as much as I'd like to say I touch up, it's too much work for me! haha But I do like how this powder doesn't have any color, I hate that cakey feeling too! This sounds lovely! 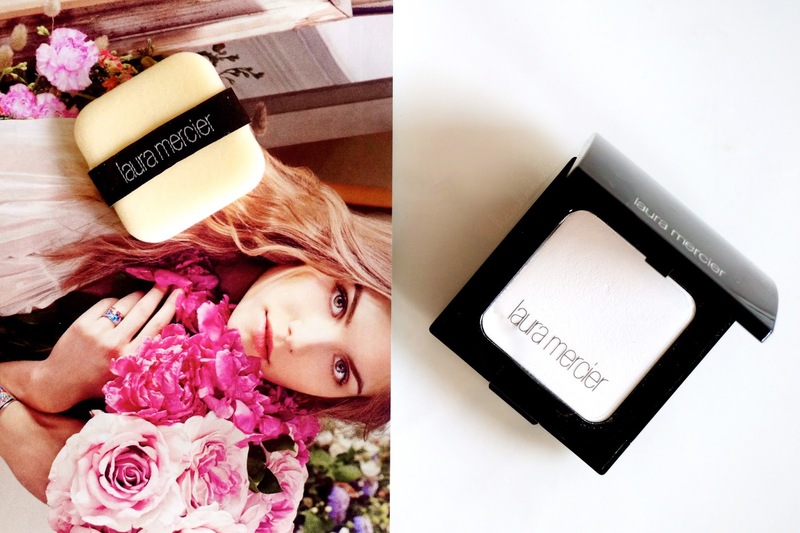 I haven't heard much about this particular powder, but I do really want to try more from Laura Mercier. This does seem perfect for on the go though! im glad this doesn't leave your skin white when used! i'm trying to find a good setting powder that doesn't leave such a trace. this sounds promising! mostly i've just been using my Dim Light from hourglass but that def leaves a tint. I know I hate touching up usually! Luckily this powder doesn't feel heavy and takes away that 3pm shine face haha. It's a good one Jenn! I hate the 'colour' on most powders as it takes away the nice finish of your foundations. Ah I've recently gone off my Rimmel powder too, so I may have to give this one a try! It was lovely meeting you the other night! I get that feeling too of beuaty products calling my name haha. Give this a try next time you're at a LM counter! I say it lasts a good 7 hours or so for me, then things get a little shiny. I haven't heard of that brand, shame it's been discontinued!